I still haven’t had that stellar Stitch Fix experience I’ve been dreaming about–the one where you open the box, fall in love, and buy everything. Of course, I still love the concept, the branding, and the customer service… but… maybe because my expectations were so high, there was only room to fall. Regardless, I’ve been given a few excuses to order new fixes (credit in my POPSUGAR Must Have box and through referrals) so ordered a couple… and ended up with a few new pieces that I liked (that came at the right price point). I almost bought my entire fourth fix, because I liked all the tops and they all fit decently well… but they sent me a pair of earrings and I don’t have pierced ears! I’m guessing that’s a bit of an oversight but that’s a bit of QA blip, no? COLOURWORKS Rowson Mesh Detail Striped Sweater – I really liked this top, but it was pricier than I would have liked ($60…?) so it was a no. OXMO Janet Cotton Tab Sleeve Top – I liked this top and was about to keep it because I don’t have a white casual blouse like it, but couldn’t get over all the buttons on the front… 2 buttons too many? EVERLY Adina Short Sleeve Zig Zag Blouse – Strangely enough, I kept this top… but didn’t LOVE it. If they were all the same price, I probably would have kept the Colourworks one. But, for the price ($38) and the nice side buttons, I thought it’d be a little bit of an adventurous addition to my closet, and indeed it has been. 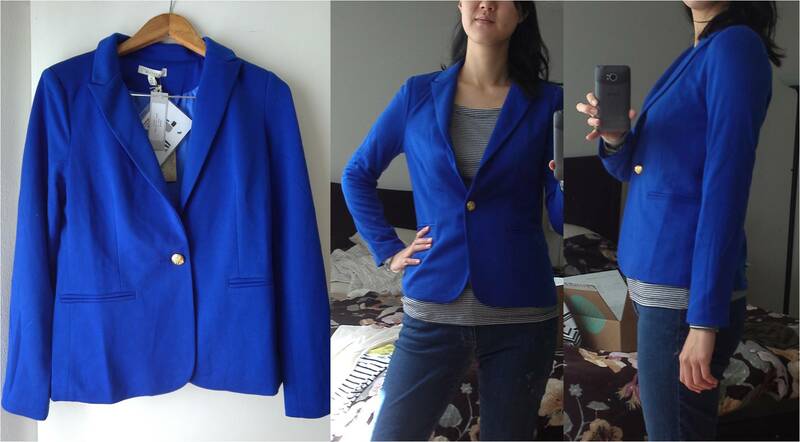 ALYTHEA Blue Blazer – I don’t remember the exact name or price, but I really liked this blazer for a lot of reasons — fit, versatility, color… yay! Then, I took a little bit of a break until a fall shipment in November, which was a pretty big bust. I’m not sure if it’s because they were busy or if it was the change in seasons or something in my profile that sent mixed signals, but I really didn’t like the three tops they sent. 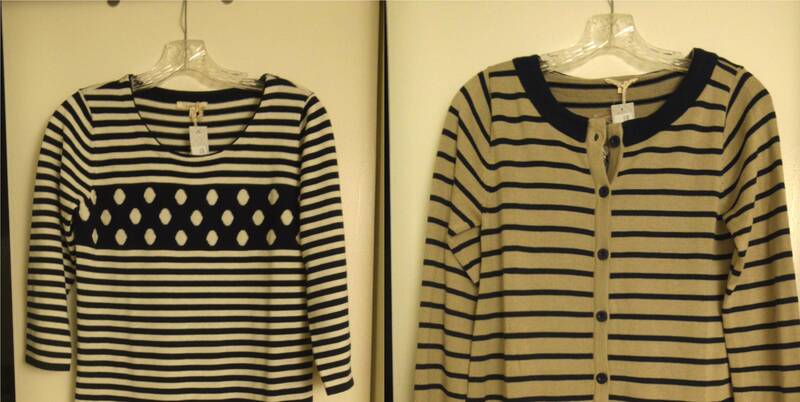 PHOEBE Dot & Stripe Sweater Dress & MYSTREE Donallan Striped Button-Up Cardigan – While I liked the texture/weight of both pieces, I didn’t like the overall styles. The dress was a nice length/size, but I didn’t like where the polka dots were — unflattering. And I didn’t like the color-blocked collar on the cardigan or the pockets… I probably would have liked both if they didn’t have the extra color blocking element. 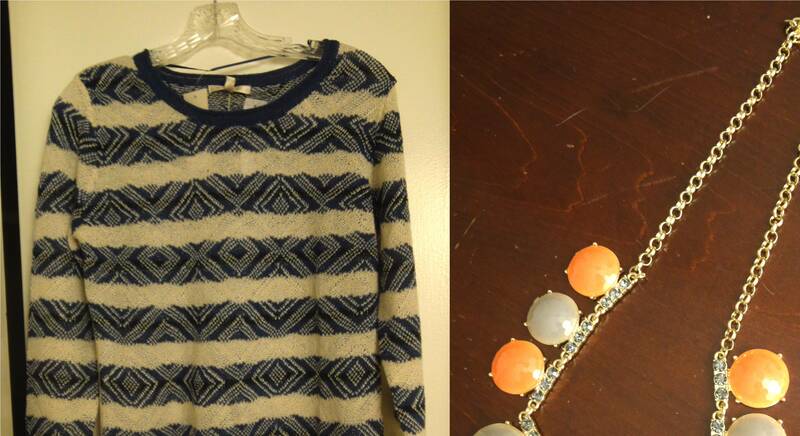 UNDER SKIES Clemente Diamond Knit Striped Sweater – Soft, but super unflattering. No pictures for evidence, ha. 41HAWTHORN Colored Faceted Circles Strand Necklace – I actually thought this necklace was beautiful, but I rarely wear orange shades (Asian = yellow-y skin and not as complimentary with the orange) so I passed. 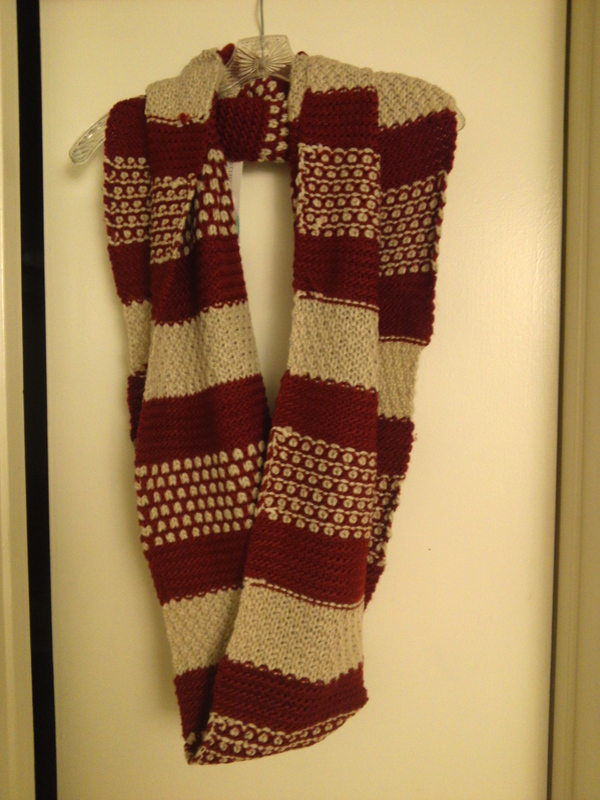 41HAWTHORN Hayden Dot & Stripe Knit Infinity Scarf – I have a lot of scarves (it’s kind of a problem), and I don’t like my $20 styling fee going to waste, and I liked the red/white color scheme, so bingo! Sooooo… as you can see, a bit of a mixed bag. Or I guess a mixed box, in this case. I still have a lot of love for the brand but am not entirely sure what it is that’s keeping me from my Stitch Fix happily ever after. Perhaps my budget? Or am I just super picky? Could be! Regardless, I’m still having fun with it and adding little things to my wardrobe, so would encourage you to try it too–if you’re curious! These boxes always sound like such a great idea (from Stitch Fix to Julep to Birch Box to…you name it), but as much as I love surprises, I think I’m also a little too picky to offer up money to have someone buy me stuff, too. Unlimited budgets would probably help, hah, but I’m also too lazy to deal with the hassle of returning stuff if they don’t work out. Thanks for the feedback on this subscription, I’ve been curious what people thought of it. Oh I love this idea. Of course, I have major trust issues so I don’t know if offering up money to have someone else buy me clothes would make me really excited or giddy or induce a heart attack when the box arrives. Ha, me too! I think I’m also super picky which is why I never quite made it work.